May is already flying by, and I am a bit behind my ideal schedule for posting this first review of the read along. Sorry for the delay! A few exciting read along announcements. First, welcome to Jackie B @ Death by Tsundoku, my co-host for the read along!! I am so excited to have Jackie hosting. She is awesome! 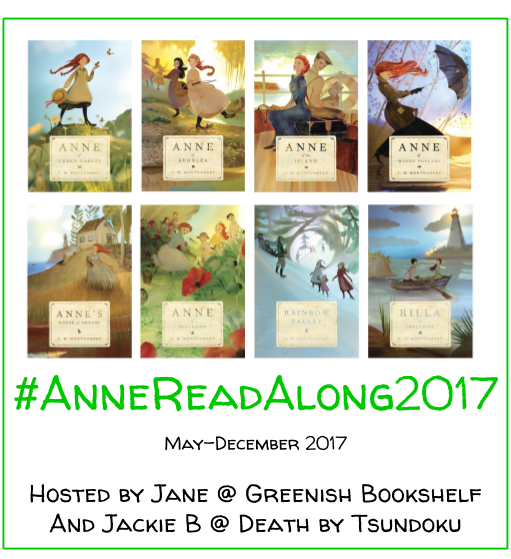 Be sure to use our read along hashtag and spread the word: #AnneReadAlong2017. It’s never too late to join! Check out the details on this page. Now onto my review! I actually posted a review of this book about a year and a half ago here. I am using that review as a guide in writing this review. Enjoy! I love this book. And every time I read it, I love it more. This story makes me happy. It’s just a feel good story that inspires me to be happier, more loving, and more kind. I want to read it over and over again. I want to be Anne’s best friend and live in Avonlea and live in this book. Every time I read it, I am reminded how much I want to go visit Prince Edward Island in Canada, especially in the fall. Anne of Green Gables chronicles the coming of age story of Anne Shirley, an imaginative and quirky orphan girl looking for kindred spirits and a place to call home. Through a lucky miscommunication, she finds herself at Green Gables, the beautiful Canadian farm belonging to siblings Matthew and Marilla Cuthbert. And she immediately wants to call it home. Anne is always on an adventure and trying to be good (while making some hilarious mistakes). After a short trial period, they adopt Anne and change her life–and Anne officially becomes Anne of Green Gables. Green Gables is one of the great settings within a novel. I hope to one day explore Anne’s Avonlea on Prince Edward Island in Canada. Because her writing is so vivid, I feel that Montgomery has already transported me her so many times. Not only is the larger setting of Prince Edward Island lovely, but I think Green Gables is equally memorable. It’s a picturesque farm that becomes a special home for Anne. It inspires me to create a similar safe haven in my home for my children. What caught my attention this time reading the novel is the depth of the secondary characters. I think we can all agree that Anne is a fabulous protagonist. But I think equally round and complex are characters like Marilla, Matthew, Gilbert, and more. I love all the characters, not just Anne. We learn so much about these characters even in a simple story. And of course, many of them continue to make appearances in later books. Perhaps these rich characters are part of the reason the Anne books feel so real. Not only is the setting real in Montgomery’s descriptions and tone, but the people feel real as well. What a great way to being the #AnneReadAlong2017! I hope you enjoyed this one as much as I always do! Link up your first review below. Enter your information in the form below, and I will add it to the list of reviews. Basically, I discovered that because I have a free wordpress account, it is complicated and potentially impossible to get a inlinkz widget on my site. So we are going with the next best thing here. Be assured that your post will be on the list below if you submit it on the above form. Thanks! See you in June for Anne of Avonlea! Oh man, I had forgotten she dyed her hair green 😀 just how awesome is that. Oh yes! I totally loved the secondary characters. They’re all so real and true to life. Haha, it’s such a classic, ridiculous Anne moment, right? 🙂 Thanks for reading! Hoping for more great secondary characters as the series progresses! Yes! Lovely review Jane. You managed to review this book perfectly, and much better than I ever could. I just linked up my post about why you should read AoGG, and we both mentioned many of the same things in our posts. I will also be posting another post, but this one will be more of a discussion type post. I filled in the information for linking my ‘review’ (it’s not so much a review, but a look at all the book covers over the years), but I’m not sure if it’s done right. Let me know if you need me to try again! Yay! I’m so excited to see your review posted. This will be really interesting since this is my first time reading the series, but you’re coming back to Anne like she’s an old friend. Have you read the entire series already? I can’t wait to explore Avonlea with you. I agree that the depth of the secondary characters are key. I love character development and watching Jane Pye and Diana and Gil all grow with Anne, but differently, were wonderful. Plus Marilla and Mrs. Rachel Lynde and Matthew too! Here is my review. I can’t wait to start the next book! Checking out your review now! There’s still time to join us on the read along and read this one 🙂 You totally should. It’s a classic! One of my favourite passages in Anne of Green Gables is in the last chapter, where Anne reaffirms that she’s “just as ambitious as ever,” even though there’s an unexpected bend in the road and she doesn’t know what lies ahead. I agree with you that a lot of the appeal of Anne’s story has to do with her commitment to searching for joy and happiness even in the midst of disappointment. I hope you’ll get a chance to visit PEI someday! It’s very beautiful. I participated in a Green Gables readalong a couple of years ago, but I didn’t join in until Anne of the Island and thus don’t have an Anne of Green Gables blog post to share. 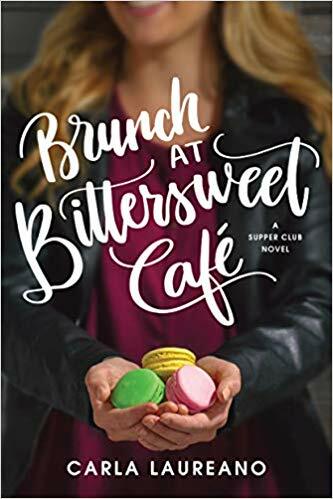 So instead, in case this one is of interest, I’ll offer you the link to a post on birthday “coincidences” in Anne of Green Gables and Jane Austen’s Emma. I hope that’s okay, and still close enough to the topic at hand! If not, please feel free to delete. That’s amazing you have visited PEI! Definitely on my bucket list one day 🙂 Your post sounds really neat. I will definitely link it up. Can’t wait to read it as well. I love Emma too! Thanks, Jane! PEI is one of my favourite places, and my family and I try to visit a few times a year. I feel lucky that I live in Nova Scotia, so it’s easy to get there for the weekend. I expect you’ll enjoy visiting L.M. Montgomery-related sites when you go. There are so many of them — Green Gables, the LMM Birthplace Museum, her grandparents’ home in Cavendish, the Anne of Green Gables Museum at Park Corner, the school in Lower Bedeque where she taught, and the list goes on! Someday I hope to visit some of the places in Ontario where she lived.